This fun challenge has definitely become a kid favorite! It involves water and building a slide! Think summer time! Water Parks and inflatable rafts. Think lemonade by the pool and kids squealing in delight. Do you ever read a line in a book that is so startling or profound or just mindlessly silly that you read it again? Isn't that the best! Welcome back to my monthly book review! I know this is a science blog, but I am a reader too! I always have a book or two that I am in the middle of reading and I love to read book reviews! So, here are five that you can try! It's Part 3 of my Summer Series about STEM! This week I am focusing on the ways I am challenged by time constraints and some little things I do to help with this! I hope you find a tip or two to use- especially if you teach multiple classes like I do! One of the first things I discovered as a teacher of multiple classes is that giving out materials was going to be a problem! This was a surprise to me. I thought laying everything out in large bins and having kids come to a supply station to get their own things was the way to go. Do you know how long it takes for kids to count out 10 straws, 12 paper clips, 50 toothpicks, and six cups? About an hour and a half. Not really, but it takes TOO long. By the time seven groups have collected their items half our time is gone. So, here's how I solve this dilemma: I use plastic shoe boxes and load the materials into them myself. It takes me less than 5 minutes to count everything into the bins in an assembly line style and then I deliver those bins to each lab table. The materials are ready to use and those plastic bins serve other purposes, too! TIP: Don't buy those plastic shoe boxes from the dollar tree. They are $1, but at Wal-Mart, the better quality bins are about 90 cents. Cleaning up at the end of the class time is another thing I didn't adequately prepare for when I started my specialist job! So, after about a month I went to the dollar store and bought eight tiny garbage cans and 8 broom/dustpan combos. Now, every lab table has its own garbage can and sweeping tools. When we finish our building and sharing time every table gets out its cleaning tools and gets to work. Learning how to do this is part of the beginning of the year procedure learning (more about this below). Every student takes part in this process- some are disassembling structures and recycling materials, others are sweeping, others are collecting garbage, and others are wiping down the tables. I also keep a bin of washcloths in my sink area and a laundry basket. I have found that washing things in the school washers/dryers works better than purchasing wet wipes! 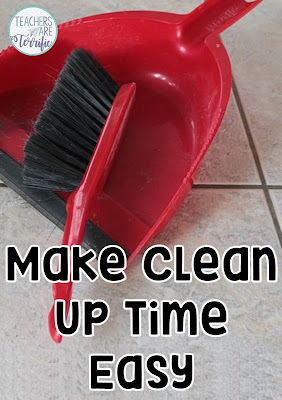 TIP: Work on the cleanup routine and practice it. We do this in the first month even if we have not made a mess. We still sweep, wipe down the tables, and pretend to throw away garbage! Classroom management is an essential ingredient to using time wisely. This was true with my regular classroom and, oh so true with a STEM class! I still remember those days when I stood before a group of kids on the first day of school and told them everything. EVERYTHING. Then when they didn't do any of the things I told them, like sharpening two pencils before class or how to check out my classroom books, I wondered why. Here's why. They only heard about the first seven words I said on the first day of school. After that, they were thinking about PE and lunch and recess and snack time. You get it. 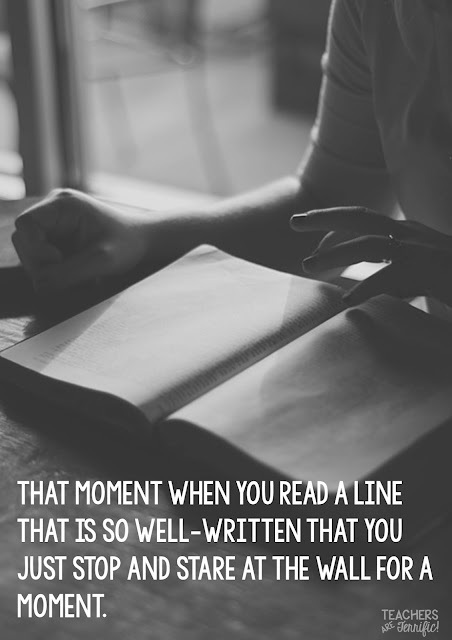 I know you do this same thing in your classroom. And that investment of time at the beginning of the year is richly rewarded later when the kids automatically do things. TIP #2: Dealing with pencils in my lab is even more perplexing because so many students use them. This coming year I am trying something new. We are going to use Bic pens. Yep! They cost very little, don't smear, last a long time, and are almost indestructible. I will let you know how it goes! Recycle, Reuse, Don't throw it away! This is good for the earth, but excellent on my budget for a busy classroom of STEM projects! So, remember when I mentioned way back up at #1 that those plastic bins had other uses. Well, here you go... I place about 5 or so of these on my main work table. At the end of class, I tell kids to sort their unused materials or gently used materials into those bins and then I add those things back to my main supply. We reuse everything. Why is this a time saver? The kids are part of this process and it's all part of our clean-up procedure. It saves a lot of work for me! TIP: This year I even saved pieces of straws for no real reason except I hated to throw away the colorful pieces and then, bam, I had a group use those pieces to decorate a bird feeder. So, if you can store things - do it. I use large zip lock bags for pieces and plastic bins for larger things. The one major thing that helps me is to prepare for storing. I have a plan for storing materials and for storing projects that are not completed! This is another one of those things I had no clue was going to happen. The first day I had a STEM class working on a project, I was scrambling at the end of class about what to do with their unfinished projects. I learned VERY quickly I needed to be ready for this every single time a class comes in. You never know what is going to happen to delay us- can you say "Fire Drill"? Anyway, I have a ton of plastic dishpans that I have ready to fill. Kids grab one and load it up with their folders and partially completed projects and their materials not used yet. We store these pans in our large lab tables. If you don't have lab tables to store pans in, then this is something to prepare for. Where will you place this unfinished work? It will save you oodles of time to have an idea about this before it happens! Okay, friends, that's a list of tips and hints and funny things to get you to think about ways to manage time best. Hold onto your hats, folks, as we dive into a few Best Practices for STEM! I teach STEM classes for three grade levels- after teaching in the regular classroom for 20+ years. Best practices or best strategies means something different to everyone. All I aim to do with this blog post is run a few ideas by you and suggest, from my experience what works in my classroom! So, just know that I am not trying to be preachy, just helpful! "We are going to have a STEM Lab next year!" Well, I didn't exactly know what that meant, but I researched a little and then went back to my principal to let her know the job was going to be mine. And it was! Now, two years later I have learned so much. Last summer I created a summer STEM series that was so much fun to write and also had great feedback from readers. So, here's a new version. Ta da---this is the Summer Series for 2016! This week's topic is all about five myths concerning STEM and how I can clear up those misconceptions for you! Myth Number 1: STEM curriculum is not creative. You just build stuff. Seriously. I read that in an article. STEM is not creative. Kids just build things and everything looks the same. Y'all. This is just not true. Even with the same task constraints and the same materials, the structures I see in class are all different. And, let me just tell you this: KIDS ARE AMAZING! They have no fear! Most of them are not striving to be PERFECT. They just want to complete the task and add their own special touches to the devices. And that's when I see their creativity! Take a look at that photo above. The kids were building a box. The constraints required that the box be a certain size and it had to have a handle. However, what we ran into was that the boxes would not stay closed when picked up by the handle. So, teams had to add a fastener to hold the box closed. Do you see what that team did? Look at the purple arrow. It is showing you the little hook they created to hold their box shut. Myth Number 2: STEM focuses on only one subject- Science. Yes, Science is a major focus. But is that all? Our favorite challenges involve the scientific method and experimenting. This means we must keep data and this involves research, calculating, averaging results, analyzing results, and concluding from those results. We write in every class. The kids must write explanations, draw or sketch ideas, jot down notes about what is happening, record improvements in their designs, and then write reflective paragraphs. We don't always research, but we do use electronic devices to find information when we need it, we find ideas to help with designs, and we use recording devices to view our presentations or create our presentations. But, here's the BIG advantage of STEM. It's not just about the academic subjects. The collaboration and teamwork are profound. Kids learn to work together as a team with the best interests of the team at the heart of the task. They learn to take on jobs and responsibilities and share the workload. They make DECISIONS! Good gracious, this is a big issue- making the right choices. I would have to say that STEM encompasses just about everything. It's not just science. Myth Number 3: STEM is only about gadgets and robots and circuits. For some people, the acronym STEM brings on the vision of robots, robotics, engines, and complicated circuitry. Those are part of STEM class, certainly. But, there is so much more. STEM includes the T for Technology and again, you immediately think of computers and then probably robots. However, technology is defined as this: It's the purposeful application of information in designing and producing goods and services or for use in human activities. Here's another meaning: Technology means using materials in a way to solve a problem. This might include using materials in an unusual or innovative way. Wow, does that sound like only robotics? No! It sounds like designing and building a device to solve a problem, maybe using materials that might not be the ordinary ones for that problem. Yet you tackle it anyway! Now, think about that! Isn't that real life? If you have not seen the movie called Apollo 13 you need to watch it. In that movie, the astronauts have to build a device to replenish their oxygen supply and they must use only the materials they have on board the spacecraft. The materials were not meant to be used for this purpose, but it's all they have (they are in space!) Friends, this is STEM! Myth Number 4: STEM is only for kids that are planning to be engineers when they grow up. This myth just makes me laugh! Seriously, who would believe this? Let me just set this one straight. STEM is for every kid! I see a little more than 350 kids each week and of that number, I would say about 10 don't like STEM projects. The rest think coming to STEM is the best part of their week. This is for so many reasons. Kids that are artists are the creative part of a team. Kids that like to build things are the construction crew. Kids that like to be exact are the tape managers or the person that keeps the group on task. My best students are NOT always the natural engineer type students. My best students are the ones that don't do well in other subjects. Struggling readers, reluctant writers, not so great at math kids... those are my best students. They work hard because of one simple fact- in STEM class, failure is part of the process and being able to re-do and improve is what they need to do all day long. STEM is for all kids. Myth Number 5: STEM is expensive. Okay, friends, I will not lie. Materials for STEM can be daunting. Goodness, I have made pancakes for THREE weeks with two grade levels and that amount of pancake stuff was over the top. But, they sure did learn a lot! I have another challenge that requires five-foot lengths of PVC pipe, but once you buy them you have them forever. And, you can always substitute broomsticks. Go see the custodian! Anyway, yes, materials can be a lot to purchase or have donated, but you can also build about anything with straws and craft sticks. So, let's just dispel that myth about materials being expensive. Good grief, go to the dollar store and buy a box of foil sheets. Your kids can build all kinds of things with one foil sheet! Come back next week for Part 2 in this series! It's about Best Practices for STEM!